My day 3 officially started at midnight last night. I went to sleep at 3 am, because I didn’t want to miss anything. The problem was that we were supposed to have breakfast at 7:30 AM with Steve and Jo Hackett. My brain, understanding the gravity of the appointment, managed to wake up at 6:45 AM despite the lack of sleep. Craig, Bill, and I met up with them and had a wonderful breakfast. Steve was very kind and attentive, and answered all of our geeky questions about Genesis and his solo career. Of particular note was his mention of a few modern acts he considers “progressive” in the truest sense: Muse, Elbow, and Steven Wilson. He also told several lovely stories about Chris Squire and John Wetton. I was impressed with his graciousness with his fans. Steve Hackett is a legend, and is undoubtedly one of the “biggest deals” on this cruise, and he has left a deep impression on me, as a person who is absurdly talented but also very approachable and down to earth. 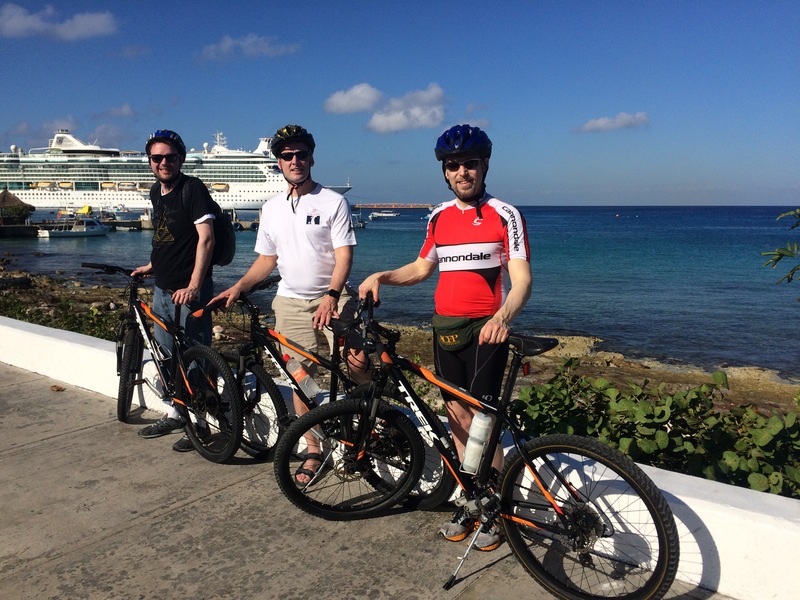 Today was our day in Cozumel. Per my roommates plans, I agreed to rent bikes on the island and bike around, even though I hadn’t biked much in maybe a decade. We rode around for about 20 miles, and I obliterated my body, but that’s another story entirely. I’ll sum it up by saying that Bill and Craig took me on a bogus journey, and now I’m feeling accomplished and happy and almost every part of me hurts. 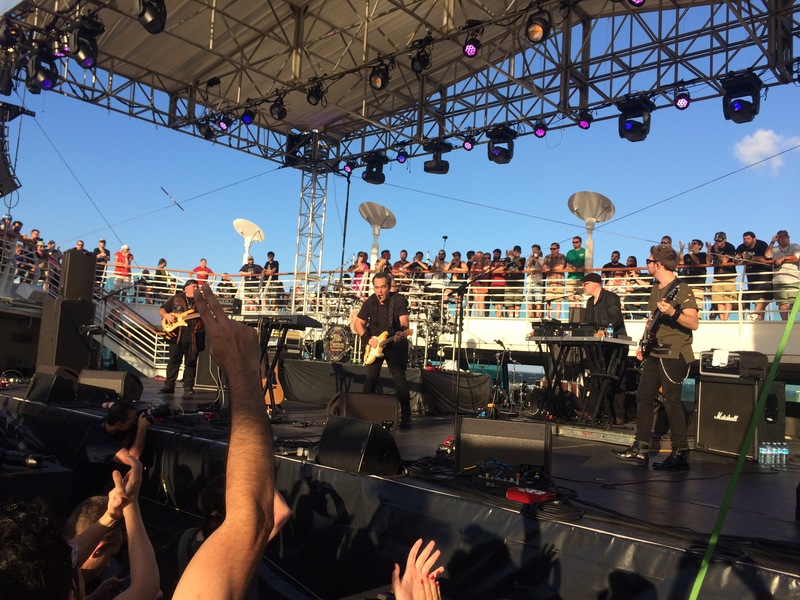 We got back in time to catch The Neal Morse Band. Xerxes reviewed their latest album a few months ago, but since then it’s been on regular rotation in my CD player, and I’m beginning to think it might be on par with Snow. 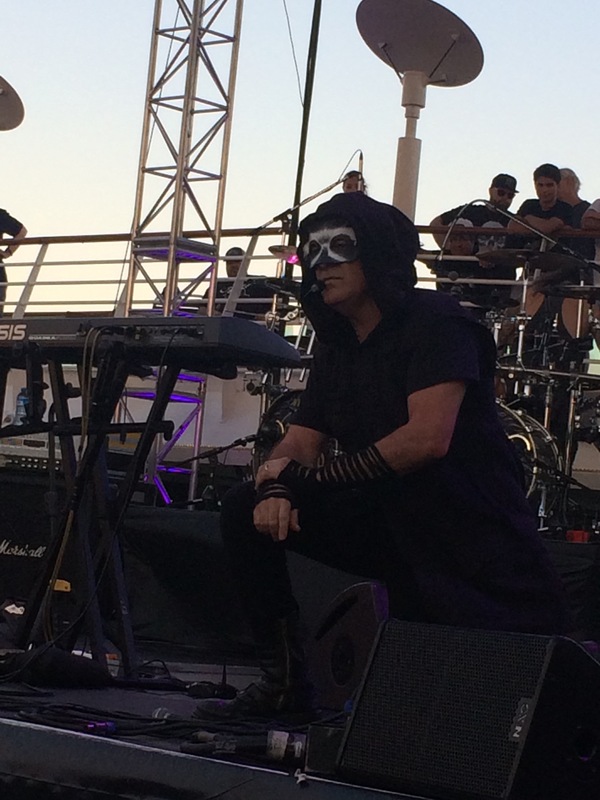 For starters, Neal and the band came into the stage dressed in some fantastic Mad Max-ish clothes. The band started out their concert with, as they said, their encore. They played a few of Neal’s more well known tracks. I was thrilled to hear the brilliant “Author of Confusion”, which was a thrill to watch live. After the opening songs, they launched into Side 2 of The Similitude of a Dream. 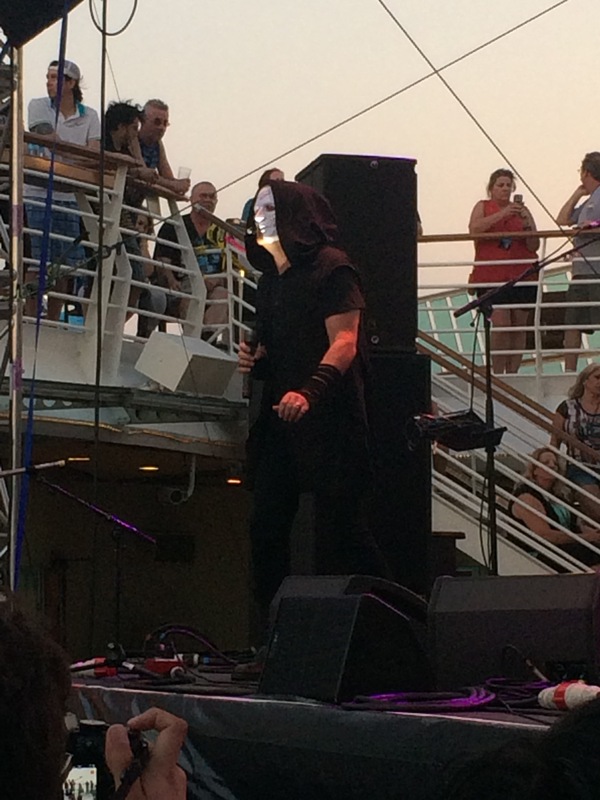 This was one of the best performances of the cruise, for a few reasons. First of all, Neal is a great showman, and was great at engaging and energizing the audience. Secondly, the current lineup for the band is stellar, and the music was performed with incredible precision. I’ll point out specifically (since everyone knows that Mike, Neal, and Randy are way talented) that the guitarist, Eric Gillette, was really impressive, both as a guitarist and a vocalist, and Bill Hubauer proved to be quite skilled on a variety of instruments live, which is no small feat. And finally, they had tremendous material that they were working with. The animal of the night was definitely a sloth, and I was especially feeling it after my huge bike ride. Before the song “Sloth” came on, Neal disappeared and reemerged with a sloth mask on. Mike had a sloth puppet hanging on his drums, and Randy had the same puppet dangling from his headstock. As the band carried on playing the song, the audience AND the band were both surprised by a man with a sloth mask being lifted up by the middle section of the audience. Mike Portnoy, after the song, remarked that that had never happened before, and he will never be able to get that image out of his head. Neal Morse’s audience was extremely enthusiastic as well. 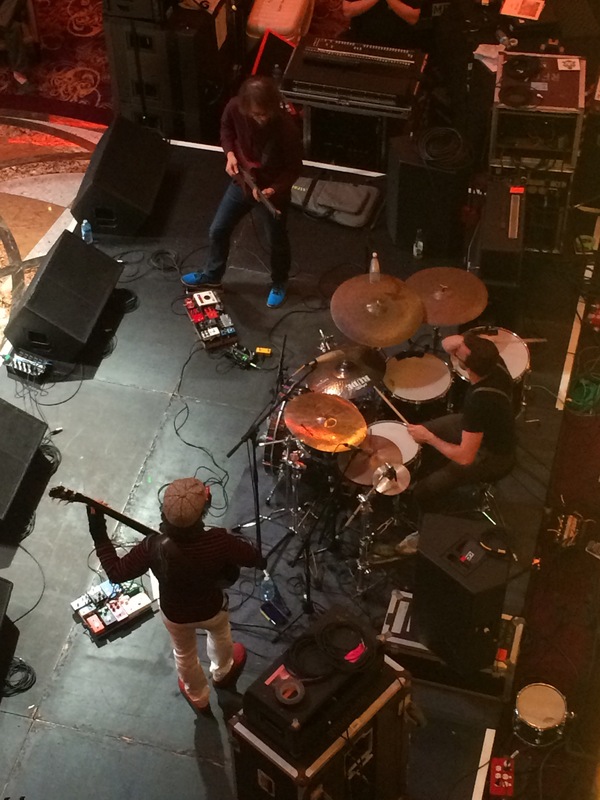 During the lively number “I’m Running”, Neal took off and ran throughout the audience and up and down the stairs. I was in a section of the audience that was gleefully dancing and jumping for most of the songs, and Neal ended up in our corner of the audience, jumping up and down with guitar in hand. Someone’s shoulder may have busted my lip a bit in the bustle, but it was worth it. The costumes, the energy, and the music made this concert truly a magical experience. 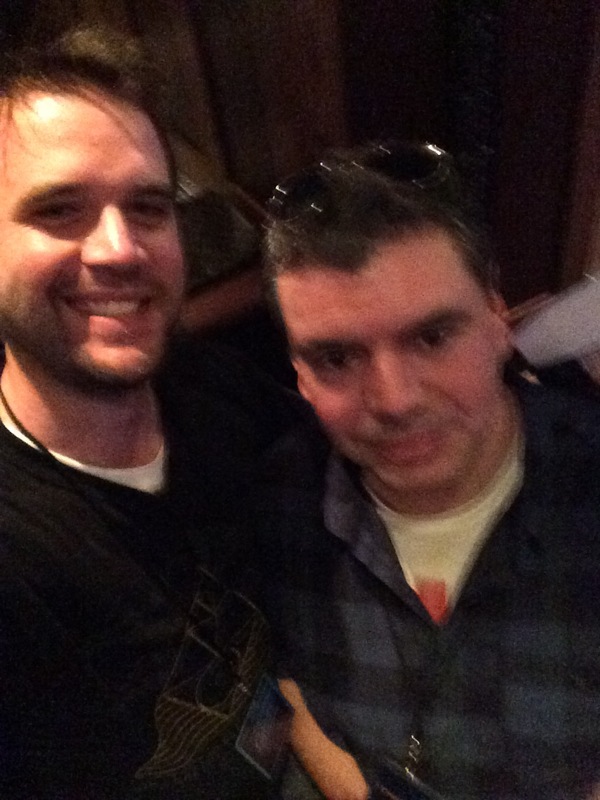 On my way to IO Earth, I saw my friend Craig in the bar. I stopped by to say hello, only to notice that he was chatting with Geoff Downes from Yes and John Mitchell of Frost* and Lonely Robot fame. I was pleased to be able to relay to John that my 5 and 3 year old kids’ favorite album was Lonely Robot, which he seemed pleased to hear. We talked a bit about the follow up album to Lonely Robot, which will be coming out in late April. Geoff and John were friendly and very funny. John also accosted me for not angling my iPhone up, so I think I’ve received the message loud and clear, as both Leslie from Distrixt 97 and John from Frost* have helped me to level up my selfie game. I made late to IO Earth, but they were fantastic. They have a really unique sound, and their lovely lead singer had a stunning voice that surprised me with its power and range. I stuck around in the venue a little longer and made my way over to the bar. I remain a spiritual person, and I often get this sense that things happen for a reason, and that people are often brought in your life to teach you something or help you see something you didn’t before. I sat at the bar outside the venue, and started making small talk with the guy next to me. I learned that he was extremely knowledgeable about music, and had also had a rough year in 2016. We traded battle stories and talked about surviving tragedies and setbacks. As we began to talk, I got this sense that I was talking to a guy that had seen some things. Well, as it turns out, this man was music journalist Lonn Friend, who was, apart from being an acclaimed journalist and rock historian, was also the editor of RIP Magazine. I felt an incredible ease talking to him, and felt like his responses were important for me to process and consider. 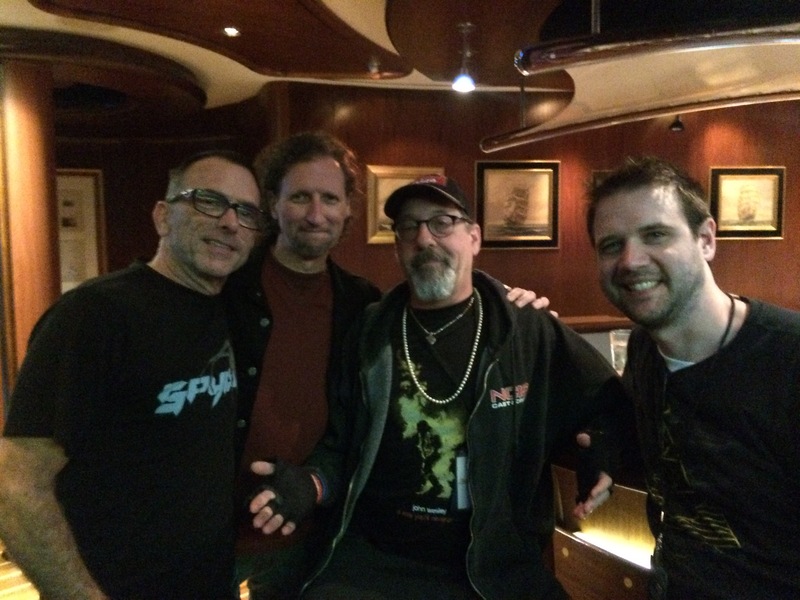 He apparently knows every major musician in the boat, and is a dear friend to all. He is also among the most skilled “hangers” on the boat, meaning he practices the perpetual art of hanging around. John Wesley stopped by with a couple friends/band mates,which was great. John Wesley and his friends were extremely kind and friendly. Lonn led us in a toast to The Beatles, as it was February 9th, aka the 53rd anniversary of The Beatles invading America. Talking to Lonn was an absolute treat, and I hope we get many more chances to chat. I caught about half of Alex Machachek’s set. It was some truly stunningly proggy instrumental jazz fusion, with lots of abrupt but choreographed stops and starts. It was almost like a mixture between Animals as Leaders and Return to Forever. 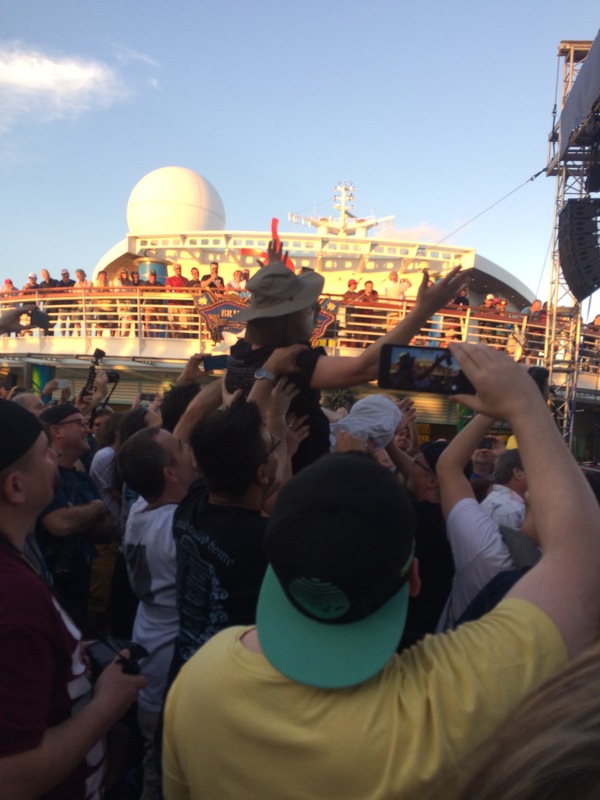 I was blown away by the incredible skill of his band, and couldn’t help but notice that the most visibly enthusiastic audience members were members of the more popular bands in the cruise. On the way out, I noticed that a small crowd had formed around the Brook Hansen’s piano rig in the bar, much like the night before with Neal and Brook. A young talent named Dennis Atlas played several songs with Brook, among them “Lady” by Styx and “Funeral for a Friend/Love Lies Bleeding”. Dennis handled the vocal parts with ease, and impressed all present with his talent. I met his mother and father, and found out that the Atlas family were all very talented and musically inclined. We all got the sense that we were seeing a future prog star. I also was able to hear the talented Joshua Batten sing “Point of Know Return” by Kansas. As it turns out, he is a talented young blues/rock musician from Australia with a bright future ahead of him. Part of the magic of this cruise is that you never know what you’ll stumble upon if you just happen upon the right thing at the right time. I ended the night listening to cruise participants singing and performing progressive rock classics. Apparently, I had just missed Patrick Moraz playing several of his works, and showed up right in time for the hodgepodge group of musicians onstage to do a pretty faithful rendition of “Sound Chaser” from Relayer by Yes. Signing out for tonight-Thomas. Tags: alex machachek, chris squire, cruise to the edge, frost*, geoff downes, John Wesley, john wetton, Mike Portnoy, neal morse, steve hackett, the similitude of a dream, yes. Bookmark the permalink.